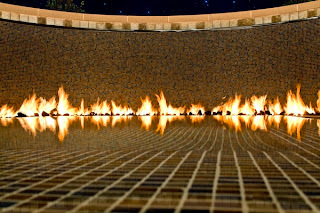 LATICRETE Building Information Modeling (BIM) information has been updated on the Autodesk Seek website (http://seek.autodesk.com/search/laticrete?source=SearchBox), and 27 new “methods” have been created and added to the Autodesk Seek website. 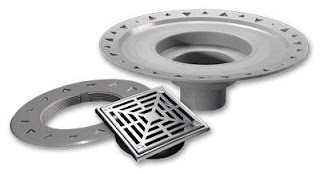 This brings the total number of LATICRETE methods available at Autodesk Seek to 267. If you work with BIM, if you work with the Revit platform please review this information that is available at the seek.autodesk.com website. Traditional building design was largely reliant upon two-dimensional drawings (plans, elevations, sections, etc.). Building information modeling extends this beyond 3-D, augmenting the three primary spatial dimensions (width, height and depth - X, Y and Z) with time as the fourth dimension and cost as the fifth. 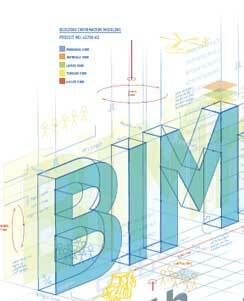 BIM therefore covers more than just geometry. It also covers spatial relationships, light analysis, geographic information, and quantities and properties of building components (for example manufacturers' details). BIM involves representing a design as combinations of 'objects' – vague and undefined, generic or product-specific, solid shapes or void-space oriented (like the shape of a room), that carry their geometry, relations and attributes. BIM design tools allow for extracting different views from a building model for drawing production and other uses. These different views are automatically consistent, being based on a single definition of each object instance. BIM software also defines objects parametrically; that is, the objects are defined as parameters and relations to other objects, so that if a related object is amended, dependent ones will automatically also change. Each model element can carry attributes for selecting and ordering them automatically, providing cost estimates and well as material tracking and ordering. For the professionals involved in a project, BIM enables a virtual information model to be handed from the design team (architects, surveyors, civil, structural and building services engineers, etc.) 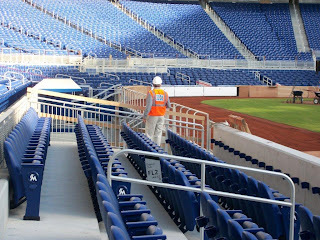 to the main contractor and subcontractors and then on to the owner/operator; each professional adds discipline-specific knowledge to the single shared model. This reduces information losses that traditionally occurred when a new team takes 'ownership' of the project, and provides more extensive information to owners of complex structures. BIM can be used to demonstrate the entire building life cycle, supporting processes including cost management, construction management, project management and facility operation. Quantities and shared properties of materials can be extracted easily. Scopes of work can be isolated and defined. Systems, assemblies and sequences can be shown in a relative scale with the entire facility or group of facilities. Dynamic information about the building, such as sensor measurements and control signals from the building systems, can also be incorporated within BIM to support analysis of building operation and maintenance. BIM also prevents errors by enabling conflict or 'clash detection' whereby the computer model visually highlights to the team where parts of the building (e.g. 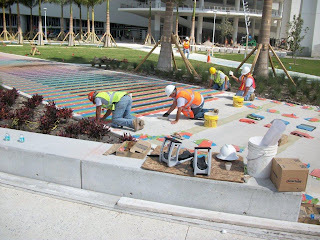 : structural frame and building services pipes or ducts) may wrongly intersect. The Autodesk® Seek web service enables designers to discover, preview, and download BIM models and specifications, and manufacturers to connect with them. Click here. 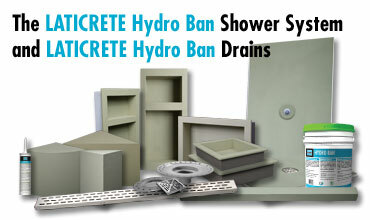 Just wanted to drop you a note to let you know it would not have been possible without your fine Laticrete products. The assistance rendered to us on this entire hospital project was first rate and facilitated the installations we are so proud of. This business truly is an assembly of partnerships and I, for one, am glad that your team is helping us accomplish our goals and those of our customers. 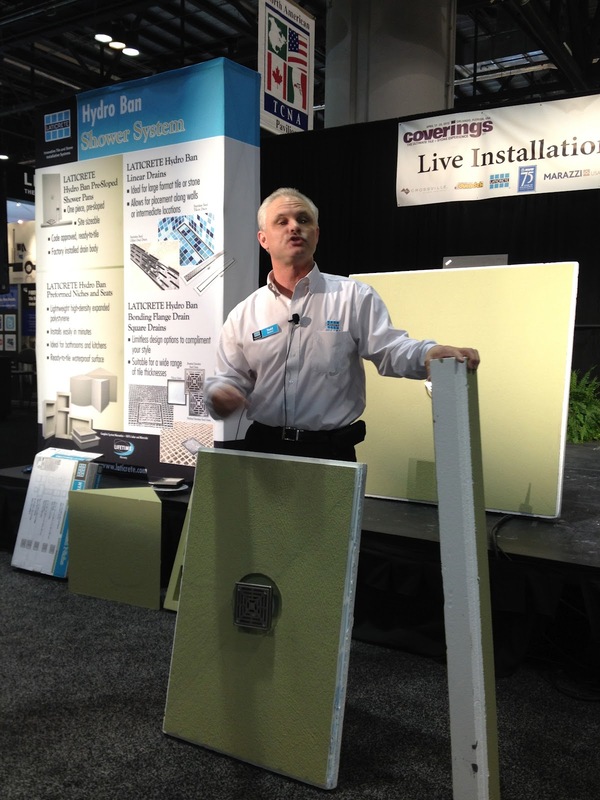 I enjoyed seeing and speaking to those of you I had the opportunity to spend some time with at Coverings last week. Your participation in the show was greatly appreciated and helped make it the success it was. I hope is was beneficial for you as well. The Spring Expo is a trade show put on by Kaough Distribution in Ft Wayne IN. 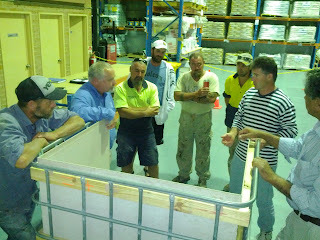 Contractors from around the area come in and talk flooring with various materials manufacturers. 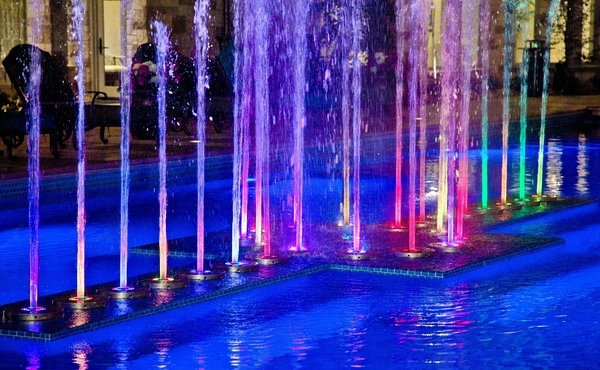 Kaough is one of our Laticrete distributors. "What a relaxing day for a cigar and a walk on the beach"
"Laticrete guy Lee Malmquist teaching Salt Lake City tile guys all about the latest and greatest Laticrete products. He did a great job explaining and demonstrating the new drain systems. Thanks for the new shirts." 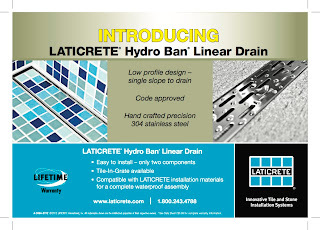 The LATICRETE HYDRO BAN Linear Drain allows for the use of large format tile or stone installations in a shower with a single plane slope to the drain. It is a low profile linear floor drain specifically designed for bonded waterproofing installations with HYDRO BAN liquid applied waterproofing membrane. The HYDRO BAN Linear Drain can be installed near the wall or at medial locations in a variety of areas requiring waterproof applications such as residential, commercial & institutional showers & gang showers. 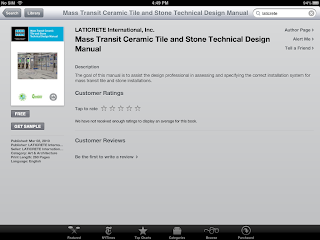 Download these design manuals directly to your iPad or iPhone from the Apple iBooks store at no cost. 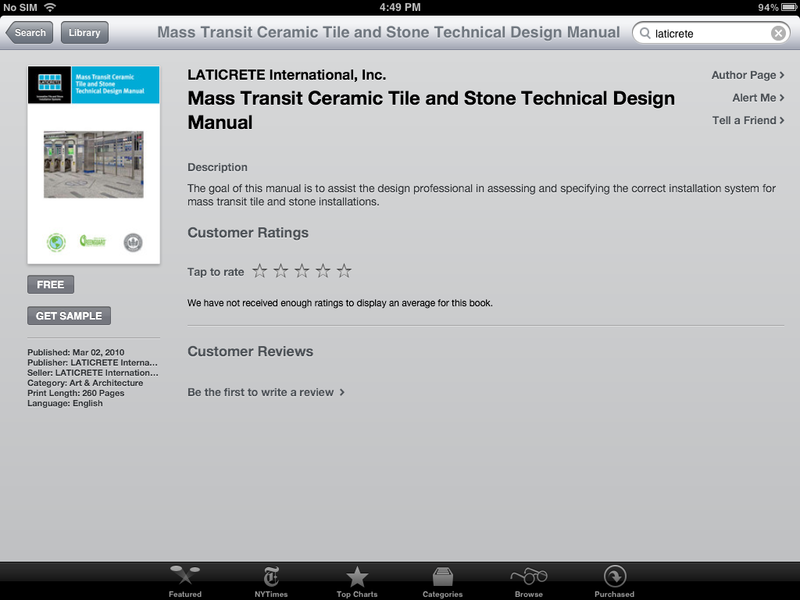 Click here for additional information regarding the entire library of Laticrete Tile & Stone Technical design Manuals or to download PDF file versions. 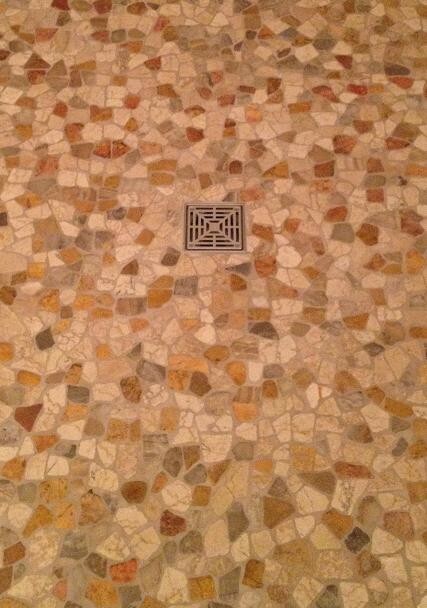 The goal of these manuals is to assist the design professional in assessing and specifying the correct installation system for tile and stone installations in specialized application areas. Whoops - I seem to have neglected to post a photo or two from the CTEF certification program held at the Laticrete training facility in Bethany at the end of last month ! 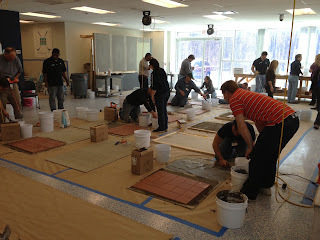 "We hosted a Ceramic Tile Education Foundation installer certification program in our Bethany facility March 29th. 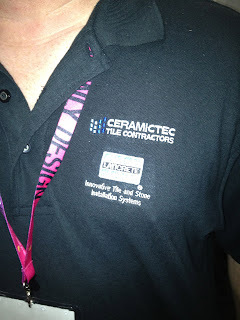 This event was sponsored by our distributor Tile America. 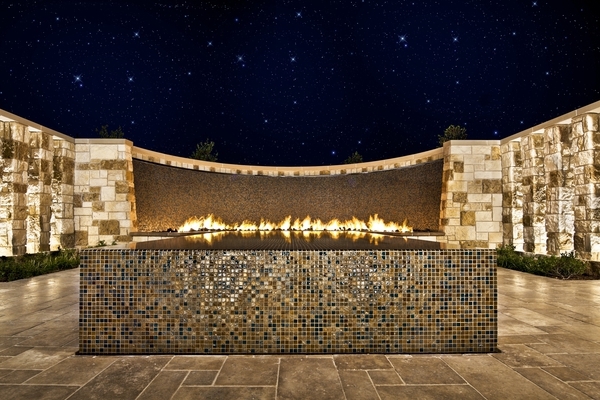 Tile America has distributor locations throughout the New England area. 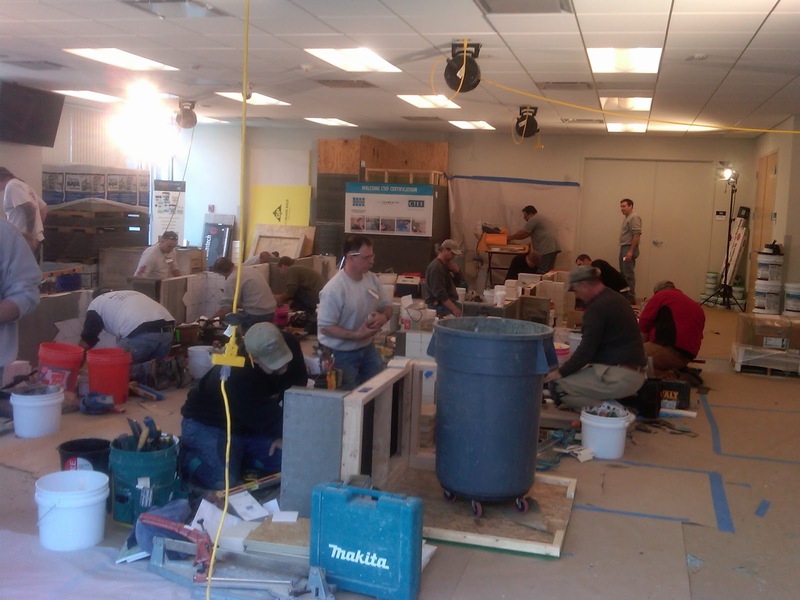 This certification event tested tile and stone installers on their practical skills. They were monitored by 2 CTEF professionals and graded on their performance. 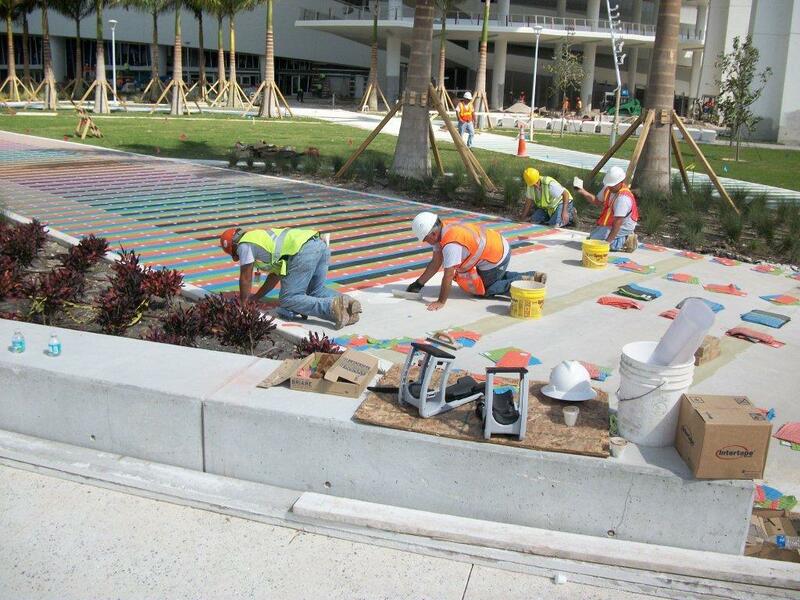 This valuable event is a positive step towards improving workmanship and installation practices in our industry." Click here for more information regarding the CTEF. 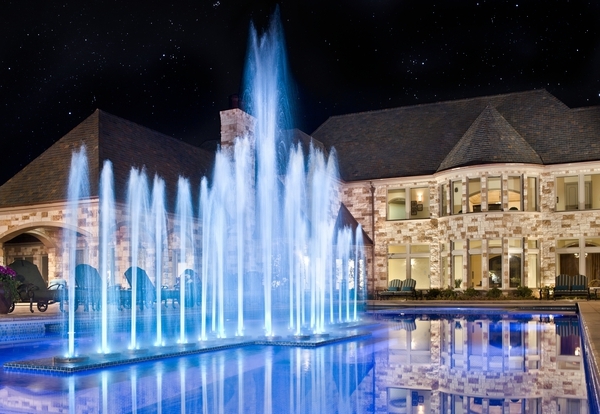 Click here regarding Laticrete training & educational programs. 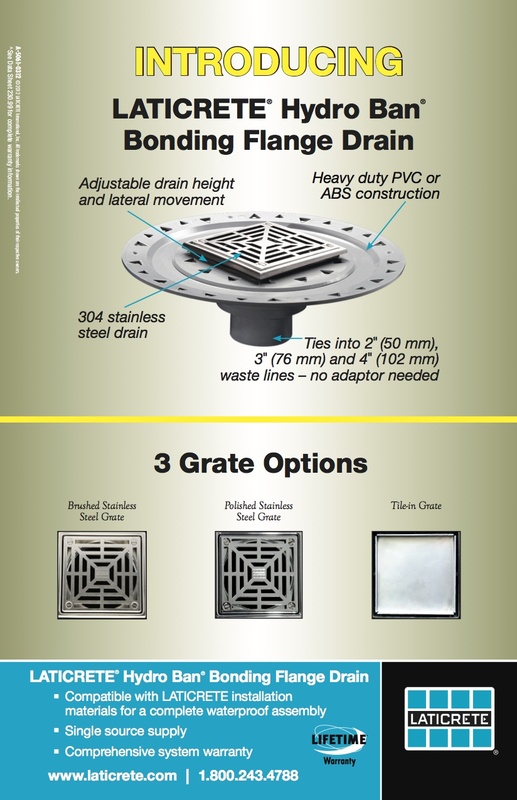 Todd Bartosz presented Laticrete Pre-Formed shower components and LatiDrains (!) 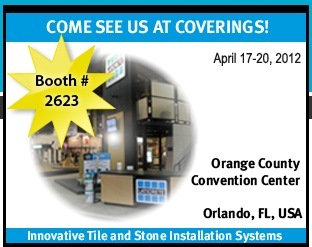 at Coverings. 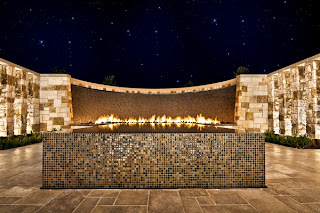 Robert is the Laticrete Contractor Sales Representative for the greater Houston, TX area. His hobby is BBQ ! At the 2012 TAFR BBQ Cook-off the results for Robert and his team = 7th in Seafood, 3rd in Chicken and 8th Overall out of 144 Teams in the competition. 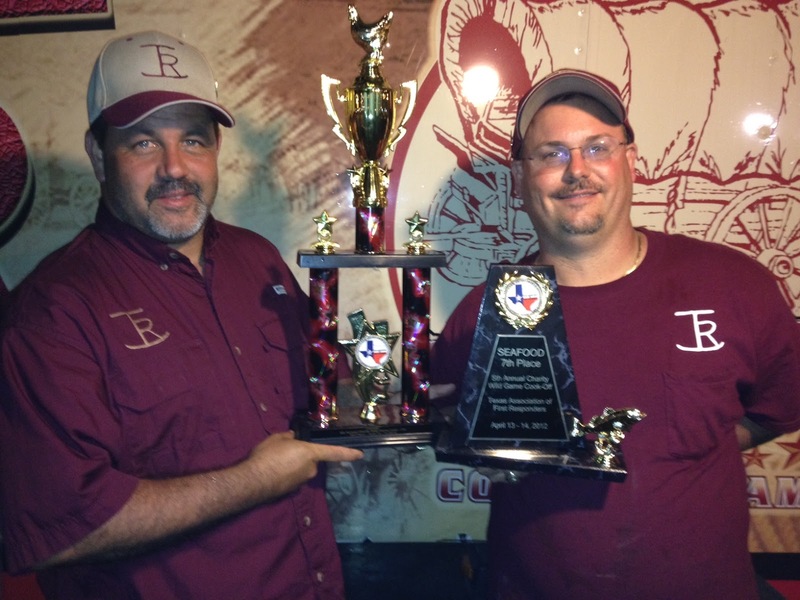 "This was the Texas Association of First Responders, check out TAFR.org for more info on the cook-off. We were trying to defend our title as Grand Champions from last year; we came up a little short but still helped raise money for a great cause. Come by the Laticrete booth at Coverings wearing a Laticrete shirt or hat, let me take a photo and win a prize ! We have a group visiting Laticrete Bethany to attend a two day Laticrete PTK ( Profit Thru Knowledge) Educational & Training program. This program focus on industry standards, industry issues, tile & stone installation materials, methods and technologies. 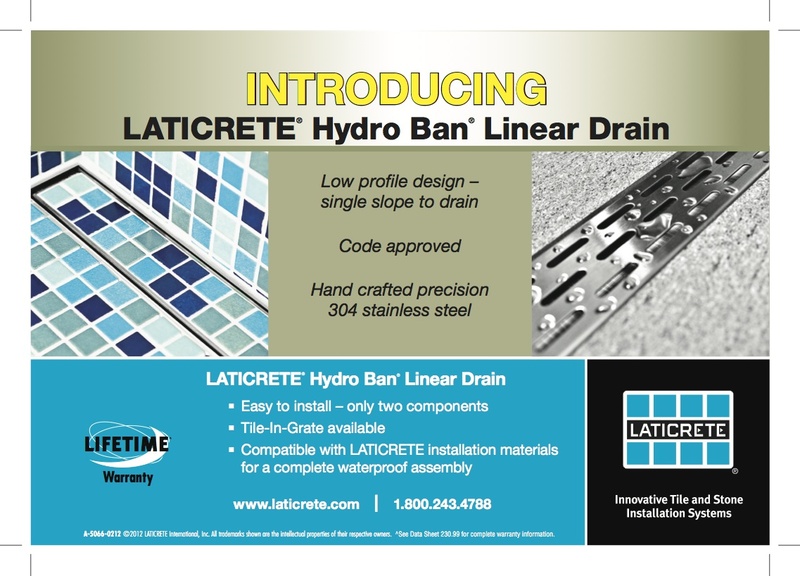 And on Laticrete products ! 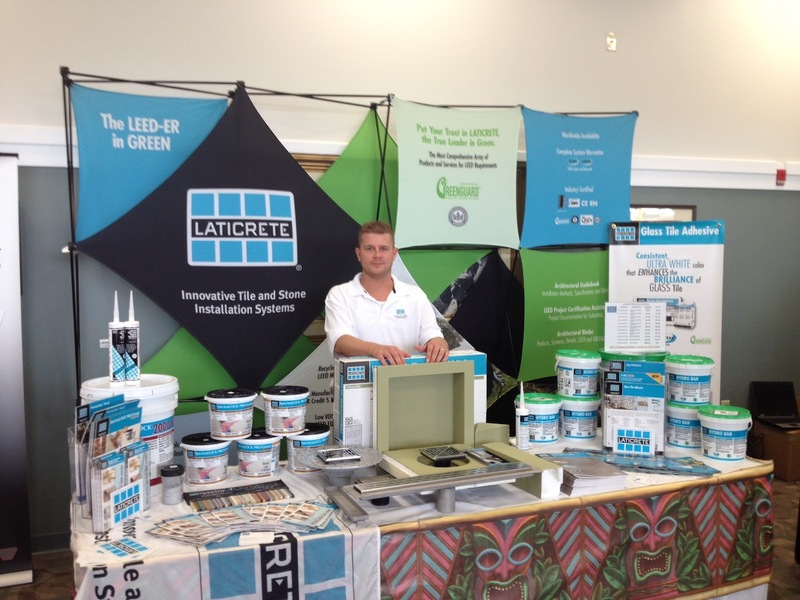 Click here for more information on Laticrete seminars. The North American Profit Through Knowledge Technical Seminar is a two day, intensive training program specifically developed for ceramic tile and stone industry distributors, dealers, and other industry professionals who want to become familiar with Laticrete products. 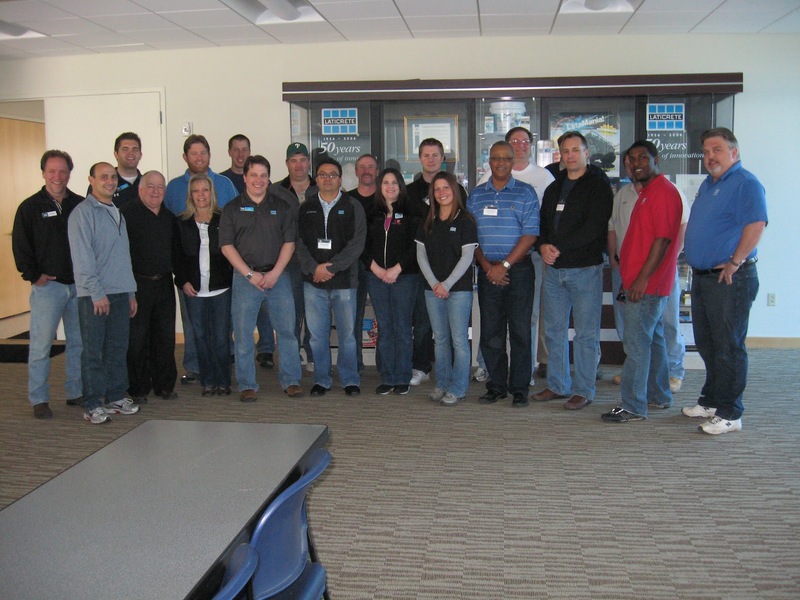 Experienced faculty utilizes both classroom instruction and hands-on product demonstrations. Attendees also have the opportunity to meet with key Laticrete personnel. Do you have a set of these on your sales counter ? If not, would you like a set ? Recently John Striednig, Director of the Specialty Products Division of LATICRETE International, had the opportunity to meet with LATICRETE customers in Sydney, Brisbane and Melbourne Australia. In addition to taking part in a HYDRO BAN demonstration and training night, he was able to spend time with our local LATICRETE Australia sales force and learn about the Australian tile and stone market. Striednig said "it is gratifying to see how robust the Australian market is in light of the global economic challenges of recent years." He went on to comment on "how sophisticated the Australian consumer is" and expressed excitement about the opportunities here for the productivity enhancing technologies and value that Laticrete delivers to this market. 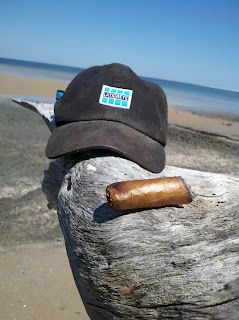 Some prefer "wet" some prefer "dry"
I prefer wet & sweet ! 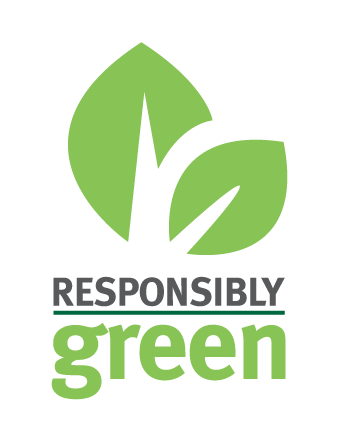 Laticrete was the first manufacturer of tile and stone installation materials to earn and offer the globally recognized GREENGUARD Environmental Institute's (GEI) certification. Based on criteria used by the US EPA, OSHA and the USGBC LEED-CI program, the GREENGUARD certification provides you assurance that Laticrete Systems, materials & products meet appropriate indoor air quality standards for volatile organic compounds (VOCs), including formaldehyde. Went for a bit of a walk in NYC this weekend. Look who we met in Union Square ! OK, so who is the guy sleeping in the background ? 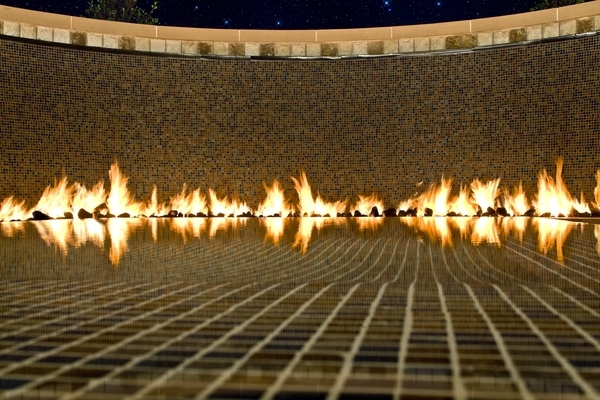 Incredible Magical Swimming Pools, Fountains & Waterfeatures with Lightstreams Glass Tiles installed with Laticrete. 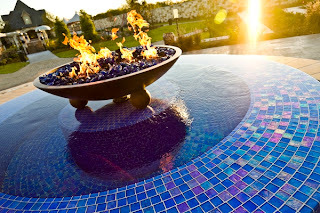 Working on a swimming pool, fountain or waterfeature ? 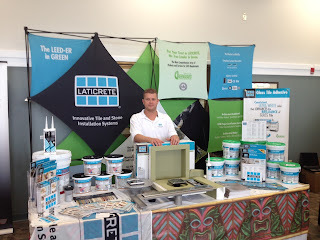 Invite your local Laticrete Technical Sales Rep to be your consultant ! Click here to contact your local Laticrete Technical Sales Rep.
Click here for additional information, specifications or details on installations of tiles and stone in Swimming Pools & Fountain.